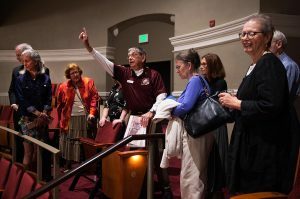 The confluence of a love of music and history, a background in teaching, and a little coaxing from former SPMH board member Norman Thomas – this was all the nudge Ron Hoffman needed to volunteer for SPMH at Music Hall. Music is very important to Ron, listening as well as playing. He’s a member of the Keyboard Club of Cincinnati, an organization in which music lovers share their interests and perform for each other. His knowledge of classical music is extensive, and he shares information freely, particularly as a mentor for a 14 year old who is studying piano and cello. He and his wife—fellow SPMH Program Guide Barbara Gomes—also sing in choruses and choirs, including the May Festival Community Chorus. When not involved in performing or listening to music, or volunteering at Music Hall, Ron is behind his camera. As with music, Ron is an artist, the camera is his instrument. His style of urban/documentary photography has been described as “ironically cinematic” and an exhibition of his images is at Wash Park Art Gallery, just south of Music Hall, through March 24th.